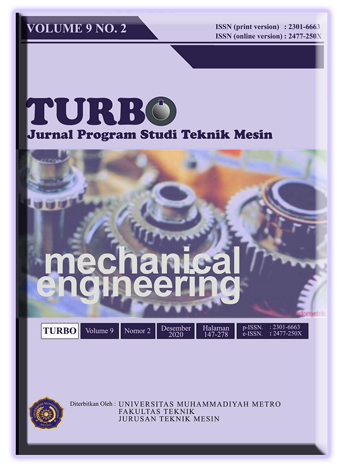 TURBO ISSN (print version) 2301-6663 & ISSN (online version) 2477-250X is a peer-reviewed journal that publishes scientific articles from the disciplines of mechanical engineering, which includes the field of study (peer) material, production and manufacturing, construction and energy conversion. Articles published in the journal Mechanical include results of original scientific research (original), and a scientific review article (review). Mechanical journal published by the Department of Mechanical Engineering, Faculty of Engineering, University Muhammadiyah of Metro for publishing two periods a year, in June and December with the number of articles 14-20 per year . Editors receive manuscripts in mechanical engineering from various academics, researchers and industry practitioners.